We tried out some of Saratoga Farms’ Freeze dried peas from The Ready Store last week, so here’s the report. 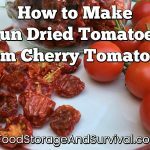 Freeze dried is different from dehydrated. Dehydrating uses heat and air flow to remove the moisture from a food. Freeze dried foods are frozen, then put through a process of quickly thawing while moisture is removed resulting in a dried product looks very much like the original product in shape and size. The texture of the final product is less dense than it’s dehydrated counterpart and usually “crispy”. The peas were in a #10 can. They will stay good stored in the can for years. I don’t know how many, but they’ll last a long time. The can says they’re good up to 6 weeks after opening the can. I’d say if it was stored in a cool dry place it would probably be good longer than that. They were actually really tasty right out of the can. Dry and crunchy. My little helper had a hard time staying out of them. We followed the instructions: Mix 1/2 cup of the dry peas with 1 cup warm water. Let sit for 5 minutes and drain off excess water. It didn’t work. The peas were still dry at the centers. So I put them in a pot with some water and heated it up. I didn’t bring it to boiling, but got them hot and then they rehydrated fully. I’ll be honest with you, my family are not pea lovers. The only way to eat peas around here is right out of the garden. They don’t like them frozen or canned or in casseroles. Okay, hubby will eat creamed peas and potatoes or peas slathered with cream of mushroom soup, but that’s about it. So as far as eating the peas, they were not a huge hit. There was nothing really wrong with them, they tasted fine, they were just cooked peas. Hubby thought they tasted a little old–they certainly weren’t right out of the garden. However, they would be fantastic mixed in a soup or with a casserole. Just don’t try feeding that soup or casserole to my kids. I’ll just let them eat the peas dry. Dry on the left, cooked on the right–you can see the color changed also as they rehydrated. I cooked up 1 cup of freeze dried peas. According to the can it should have made 1 cup of peas, but it was actually closer to 1 1/2 cups of cooked peas. As required by the FTC, I received samples from The Ready Store in order to write my review. I am an affiliate of The Ready Store (click through their ad on the sidebar). The opinions expressed in this post are mine. I've been looking to add some veggies to my prep stores, but the freeze dried are just so expensive. I'll be doing a lot of dehydrating and vacuum sealing this summer. Based on your description, they sound like the Wasabi Peas you can buy for snacks. That might be a good (albeit expensive) way to get the kids to eat their peas! Peas are one of my favorite foods! I'll eat them just about any way they're fixed, including right out of the can! Favorite of mine is pea salad…makes me hungry just thinking about it!